The flower spikes have bright purple corollas on the sides and top bracts that change color as they age from white to light pink. 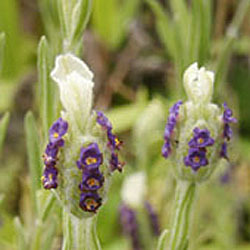 Growth is typical of Spanish lavenders - a bit sprawling and the scent is piney-lavender . Categories: All Items, all potted plants, deer resistant, lavender plants, Potted Plants, More..